North52 run boat tours across the Moray Firth from Lossiemouth to Findhorn, and will now be offering services at Nairn harbour. 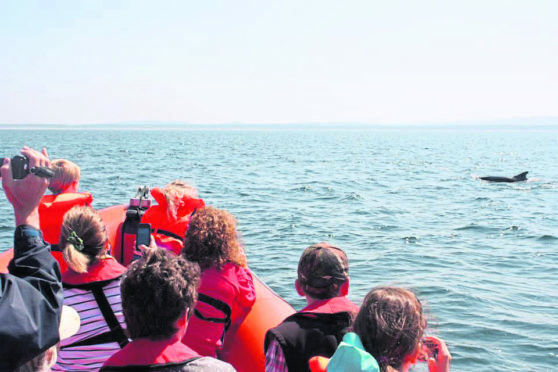 North 58 Sea Adventures provide tourists and locals with trips out to explore the Moray Firth coastline and the abundant amount of wildlife there. That includes dolphins, seals, porpoises and occasionally, basking sharks. The firm run tours from both Findhorn and Lossiemouth, but has now announced it will also be operating from Nairn after taking over Phoenix Sea Adventures. Simon Paterson, managing director of North 58, said the move was ideal way to keep growing his business without harming wildlife. He said: “It is our neighbouring harbour so it was ideal for us to help continue our growth. “We can’t just keep increasing the number of boats we put in the water at Findhorn or Lossiemouth as it would have a detrimental effect on the wildlife from Lossiemouth to Findhorn. Mr Paterson is the owner and operator of Findhorn Marina along with his wife Karina, and is also the chief coxswain and founder of Moray Inshore Rescue Organisation (MIRO). North 58 had a successful year in 2018, and delighted around 7,000 from every nationality as they toured the area. Mr Paterson hopes that the new Nairn site will offer a slightly different variety of wildlife from the other two locations. He said: “We are currently doing a few trial runs from Nairn to find out what exactly there is and what we can offer on the tours. “There should be some pods of bottle nose dolphins, along with some seals towards Fort George and wildlife birds such as gannets, ospreys and peregrine falcons up at Cromarty. “The Nairn season starts in April so we are hoping to have everything ready by then.